The past and the present are deeply interwoven when birth marks are	indelibly imprinted onto an individual's physical body. This happens for two reasons. One, the body has not had enough time between its incarnations to heal properly. Two, the mind needs to reconnect with the past life trauma so it can be healed and released. So a birth mark is formed at the site of the past life damage when the individual chooses to reincarnate into a new life. When we come into greater awareness of our past lives, we understand that we are more than our current personality. We see that we are infinite beings and we connect with the truth about the totality of our existence. We ask ourselves "who really is the I that is me?" From time to time, the answer to this question leads us to learn more about our birthmarks, the roadmap to our journey in past lives. Unhealed Burn Mark: This deep red birth-mark is the body's way of remembering being burned by fire. The darker the mark, the less the wound has healed karmically. Usually this is because the past life is recent and the related trauma has not been processed. Healed Burn Mark: This ultra white birth-mark is the body's way of remembering being burned by fire. The lighter the mark, the more the wound has healed karmically. Although it is somewhat healed, there are still lessons to be learned from this old wound. Single Bullet Wound: This birth-mark was caused by a bullet that entered on the left (notice the perfectly round pattern on the left compared to the right side). The uneven pattern on the right is a remnant of a related powder burn. This wound tends to be brown. Embedded Bullet Wound: This birth-mark was caused by a bullet that became embedded in the body (and part of it). Notice the perfectly round shape of an antique bullet as well as the "burn" ring around this birth-mark. This wound tends to be black. Sunken Bullet Wound: This birth-mark was caused by a bullet that became embedded in the body (and part of it). Notice the rounded shape of a blasted antique bullet as well as the deep indentation of this birth-mark. This wound tends to be red. Scattered Shots: This pattern of marks was produced by sprayed shots (a bunch of bullets shot all at once) by an antique gun. The pellets of varying sizes all struck the skin at the same time in a tight pattern. This very common pattern can exist anywhere on the body. Cannon Shots: This birth-mark is becoming increasingly rare as time passes because cannons are no longer used as weapons. This wound tends to be black as the cannon shot deeply scorched the skin. With each new life, the size of the cannon birth-mark shrinks. Stab Wound: The slightly curved birth-mark is indicative of a fatal stab wound inflicted by a knife, dagger, or sword. When these appear on the side of the face (as in this case), it was most likely from a sneak attack while sleeping and was undoubtedly fatal. Speared Through: Spots on the eye are almost always from being directly punctured there. This was a favorite form of assasination in past lives. It was usually done when the individual slept. It always proved to be fatal because a stab in the eye was a stab to the brain. Scalped: The birth-mark features a patch of the scalp where hair cannot grow and a "bloody looking" patch appears in its place. 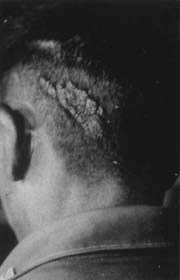 This is how the scalp would look after the patch of hair was forcibly removed. It is how the body remembers being scalped in past lives. Poisoned Arrow: The birth-mark features a central mole with a discolored ring around it (depicted) and usually comes from past lives. This is how a poisoned arrow wound looked. If the arrow did not kill the person, the poison it was dipped in would do so. Botched Surgery: In past lives, often the cure for a disorder was worse than the cause. This was especially true of surgeries which were done without anesthesia and often without a clear idea of how to do it. More often than not, past life surgery proved to be fatal. Branding Mark: In past lives, those who had committed crimes were often branded with a hot iron. This mark is a faded dragon brand which was placed on the back of the neck of Chinese activists and dissidents to mark them as enemies of the state. Slave Chains: In past lives, those who were in chains had their skin rubbed raw where it was constantly chafing against them. This damage was often so deep that the body would layer the area with callouses as a form of protection that often carries forward as cancer. Remnants of Torture: In the past, one of the ancient torture techniques was to place a band or rope around the head and tighten it until the individual "confessed" or died. Often this torture proved to be fatal as well as leaving a birth-mark. Suicide Wound: This birth-mark is the kind left when an person committs suicide by shooting a gun into their head. This birth-mark is unusual is that it features a red mark which looks like a trail of blood dripping from the point of bullet entry at the top of the head. Plague Bubo: This birth-mark looks like a wart but is not one. It is the body's way of remembering a bubo from a lifetime during the Black Death (also known as Bubonic Plague). Living through a pandemic is super stressful and often takes many lives to heal. Harsh Hairs: This birth-mark is known as a "Morgellons Fiber" which mimics the stages of Syphilis: canker-like open sores (Stage 1 Syphilis), raised or mucuous like skin patches (Stage 2 Syphilis), and infiltrative, destructive lesions of skin (Stage 3 Syphilis). Leprosy Patch: This birth-mark looks like a wart patch but is not one. It is the body's way of remembering the initial spread of leprosy as the patch always forms on the spot of the first outbreak. Like the plague, leprosy often takes many lives to heal. Scars are reminders of the rough journey of discovery that karma has taken us on through our many cycles of reincarnation. If we are willing to look back into the past life origins of our scars, we will - not only - learn about who we have been... we will discover who we are capable of becoming. * Purpose of Scars: Scars are reminders of past events. Physical scars, marks on our skin, remind us of past events where our body was damaged in a way that did not heal fully. Mental scars, painful memories, and emotional scars, flashbacks with feelings, serve to remind us of past events that were unpleasant and traumatic. * Reminders of Failure: We reincarnate with scars to remind us of what we did "wrong" in the past. My skin is full of scars which remind me of how careless I used to be about my physical well being. One section is littered with spots that look like healed over burn marks from a past life where I rushed into a burning building to rescue some children. I could and should have thrown something over me for protection but I was too impatient. While I did rescue those children, I also failed to protect myself… and my scars remind me now to take better care of myself. * Reminders of Success: We reincarnate with scars to remind us of what we did "right" in the past. A chunk of flesh is missing over one eyebrow. This is the site of where a battle axe became lodged there. I left that scary weapon there so that I could continue fighting as well as to intimidate others who saw it. This worked better than I could have imagined and helped to turn the tide of battle. This scar reminds me of my courage and ability to solve problems better now. * Reminders of Love: We reincarnate with scars to remind us of what we have done out of love for others. There is a scar on one finger which reminds me of how I saved the life of one I loved deeply in a past life. We had been out walking when we were attacked by thieves. I managed to disarm them and scare them away. In the process, my finger was sliced open but I got the help of a great doctor in time to save it. This scar reminds me of all the memories of the one I still love deeply. * Scars Meaning: So scars remind us of whatever we choose. If you have scars and have survived the events which created them, then they should be sources of pride. If you can learn from your failures, be proud of your successes, and cherish the love in your life, then your scars have served you in the best way possible. Did you know that your body is a road map to your past lives? Here is how to read that map! All of the following items on your body are tantalizing clues to your past lives. The more prominent these items are, the more recent the damage... that is crying out to be healed. Here is how your past is still present. * Freckles-Albinos: Freckles (dark spots) and albinos (white spots) are often located where you have been burned by fire in past lives. Those who suffer from burns will tell you that fire leaves its mark on the skin permanently. Freckles and albinos are usually signs that you need to heal fire karma from past lives. * Skin Depressions: Skin depressions (where the skin is pitted, grooved, and rough) whether caused by injury or diseases (like smallpox, chicken pox, and syphilis) are often where you have been wounded in past lives. They are reminders of the issues from past lives that you have come to heal in the present lifetime. * Moles-Warts: Moles and warts are often located at the site of non-fatal disease lesions from past lives. Even though moles and warts have present life origins, they tend to gather around sites of past life trauma. Especially if you are having trouble in healing them, moles and warts may signal the need for past life healing. * Cysts-Lumps: Cysts and lumps are often located at the site of fatal disease lesions from past lives. For example, hard cysts-lumps in the hands, feet, and lymph nodes can be reminders of a traumatic death by plague in past lives. Especially those cysts and lumps which "grow back" may signal the need for past life healing. * Tumors: Tumors are often located at the site of fatal wounds inflicted by weapons in past lives. Tumors are the ultimate indicator that a past life is screaming out for healing in the present. Tumors usually demand a person's attention, forcing them to take action to save their life now, even if it means healing their past lives.